Foreign-currency weakness has been worse in some areas than others. Image source: National Museum of American History via Wikimedia Commons. U.S. investors have seen countless references to the strong dollar in the earnings results of multinational corporations in recent years, as the greenback has climbed against most major foreign currencies around the world. But the dollar hasn't been equally strong against all of its foreign rivals, with certain regions seeing huge declines in their currencies while others have held up relatively well. Let's take a closer look at the disparate impact of the strong dollar across the world. Many of the financial powers that have seen their foreign currencies drop the furthest against the U.S. dollar have economies that have benefited greatly from the former strength in the commodities markets. In the emerging-market world, Brazil was one of the big winners from strong demand in past years from China for products like crude oil, copper, and iron ore. As that demand has dried up, Brazil has seen its economy take a massive hit. 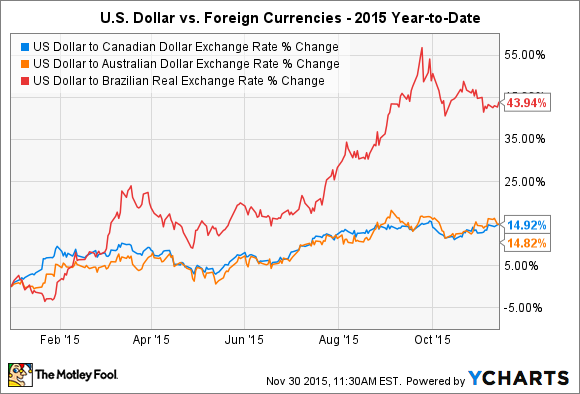 As a result, the dollar has risen sharply against the Brazilian real. US Dollar to Canadian Dollar Exchange Rate data by YCharts. Similar though less extreme moves have taken place in Canada and Australia. Both countries have substantial mineral wealth, with Canada having benefited greatly from the economic viability of its rich oil-sands deposits in Alberta when crude oil prices were above $100 per barrel. Both Canada and Australia saw their financial conditions improve dramatically due to high prices for mined products as well, with the surge in both precious metals and base metals sending both the Canadian dollar and Australian dollar above the parity level with the U.S. dollar for extensive stretches during the early 2010s. With the commodity bust, both currencies started tumbling, and after poor performance last year, the forex-tracking CurrencyShares Canadian Dollar (NYSEMKT:FXC) and CurrencyShares Australian Dollar (NYSEMKT:FXA) fell double-digit percentages again in 2015. The U.S. economy has regained much of its strength since the financial crisis in 2008. Europe hasn't been as lucky, with the continental economy continuing to show signs of weakness and requiring dramatic policy moves from the European Central Bank to try to spur economic growth. Even as the Federal Reserve has tried to prepare U.S. investors for higher interest rates, central bankers in Europe keep looking at moves like expanding its quantitative easing program. Many bond markets sport negative interest rates, yet inflation has been extremely low. The disconnect between the U.S. and Europe has led to a flood of European interest in the U.S. dollar, given that dollar-denominated assets still have positive yields and could see interest income rise as the Fed hikes. 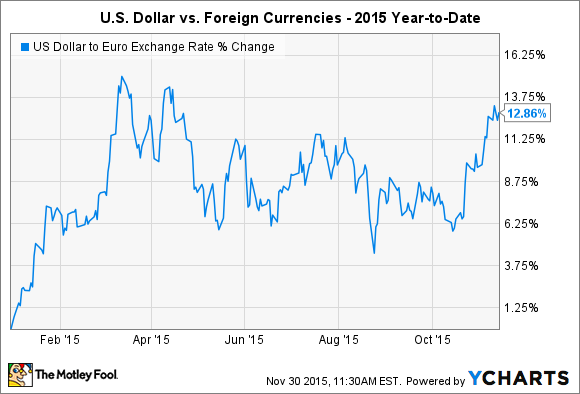 The CurrencyShares Euro ETF (NYSEMKT:FXE) is down double-digit percentages in 2015. Many now see the potential for euro-dollar parity in the near future, adding to the euro's woes especially if the Fed and ECB take two separate policy paths going forward. In contrast to other regions of the world, Asia has seen relatively small declines in the value of its major foreign currencies compared to the U.S. dollar. Among emerging markets, both China and India have seen only minimal drops in their currencies. Japan has also held up well, stemming the decline in the yen that the island nation has seen in past years. What all three have in common is that they are major purchasers of commodities, so they have each seen big benefits from falling commodity prices worldwide. US Dollar to Japanese Yen Exchange Rate data by YCharts. The interesting thing is that both Japan and China have started taking many of the same steps that Europe has in order to spur faster growth in their respective economies, yet currency investors haven't penalized the two Asian giants in the way that they have their European counterparts. For China, the increasing recognition of the yuan as an international currency has helped strengthen its value. Yet even Japan's ongoing stimulus efforts and mixed results in its economic policy have still left it seen as preferable to the euro, and the CurrencyShares Japanese Yen ETF (NYSEMKT:FXY) has seen only modest declines in 2015. Meanwhile, India has seen dramatic economic progress under its new government in recent years. The stock market has paused in its advance, but the Indian rupee continues to reflect enthusiasm about the emerging market's future prospects. Overall, how much a company gets affected by the strong dollar depends on where it does the most business. Those that get a lot of revenue in hard-hit areas like Brazil and Europe will see more negative currency impacts than those doing most of their business with the Asian region. The strength of the U.S. dollar will continue to weigh on investors in U.S. multinational corporations. Yet by understanding exactly where the dollar is strongest, you can pick out the stocks that are most likely to survive currency shocks and find avenues for growth. 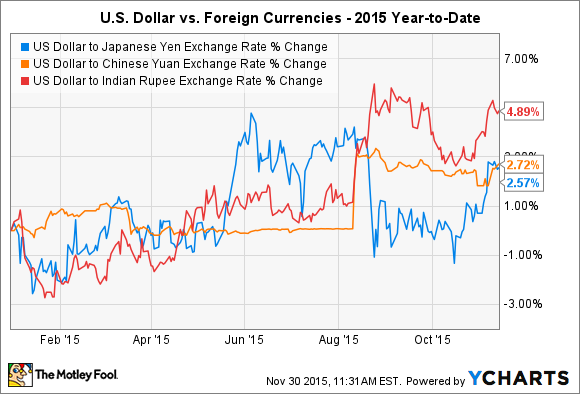 Currency ETFs: The Best Way to Play a Falling Dollar?